Casual observers might not have heard of Bring Me The Horizon before, despite the band being forged in Sheffield in 2004. They’ve only begun to sneak on to radio charts in the last few years. The sound on upcoming album ‘Amo’ is drastically different to the one the group made their name with in the early days in the steel city’s clubs. But their trajectory was always headed in this direction. They have always made a point of saying they want to be the catchiest and heaviest artist in the mainstream. By bringing in keyboard player and backing vocalist Jordan Fish in 2013, Bring Me The Horizon began moving towards the sound they have now consolidated. That shift was apparent on Saturday night in Leeds. 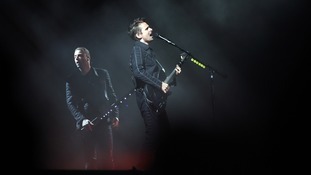 From the opening of their set with the first single from ‘Amo’, Mantra, the band stuck mainly to hits from breakthrough records ‘Sempiternal’ and ‘That’s The Spirit’. The early material gets a run out in the form of a medley, something which some of their newer fans will probably have struggled to grasp how the chart topping group formed from such aggressive beginnings. Frontman Ollie Sykes has always been the star turn, and there’s little to suggest otherwise in their live act. From the moment the band walk out on stage, Sykes, covered head to toe in tattoos and dressed in a manner that says he knows he is at the helm of one of the most in demand acts in the world. He has the crowd in the palm of his hand for the evening, and as far as homecoming gigs go, the reception is deafening. Musically the band are tight and polished, from years on the road, and now hitting the heights of the country’s biggest venues and festivals. Bring Me The Horizon stand on the cusp of something big. As the confetti slowly settles and the ears of a satisfied crowd ring to the final notes of anthem ‘Throne’ on Saturday night in Yorkshire - it feels like the boys from Sheffield are ready to take on the world. Ed Sheeran will play two concerts in Roundhay Park, Leeds next year as part of his new European tour. The American punk rock band will open their UK tour in the city this February. Foals and Disclosure have been announced as the latest co-headliners for this year’s Leeds festival. Leeds Fest, which takes place across August bank holiday weekend at at Bramham Park, will also be headlined by the Red Hot Chili Peppers. I couldn’t be more excited about this announcement. A co -headline with two of the most promising British acts out there; Foals secret set last year was a highlight for me, as I’m sure their debut headline slot will be, coupled with the phenomenal Disclosure – we’re very proud to be able to give these acts the recognition they deserve. Our reporter Adam Fowler has spoken to Madness frontman Suggs at Lincoln's Sincil Bank Stadium. They are performing at the home of the Imps as part of the band's grand slam tour of major sports venues across the country. Iconic Sheffield band Pulp will be presented with a heritage award later today. They will receive it at the Leadmill club in the city, where they first played 35 years ago. A music teacher has been convicted of arranging for unsuspecting students to take bogus piano exams in front of a phoney official. One of the UK’s longest running live music venues, The Leadmill in Sheffield, has this week again been recognised as a top UK live music venue, after 35 years in the music business. The prestigious Music Week awards were held at The Brewery in London on Thursday 25 April and the Leadmill was one of five to be recognised, alongside The O2 Arena in London and the winner, Black Heart in Camden. Founded in 1980 and still independent, The Leadmill kicked off the careers of bands such as the Arctic Monkeys, Cold Play, Culture Club and the Killers before they became international stars. With around 165,000 music fans flocking to the venue every year, some of the most recent acts have included Babyshambles; Inspiral Carpets; Strypes; Architects; and 5 Seconds of Summer. Rebecca Walker, Live Music Promoter at The Leadmill said: “The Leadmill is known for its raw energy, great bands and being the place to go to see cutting edge music and the latest thing before they become famous. Other accolades have included Venue of the Year at Fly Magazine Awards 2014 and Best Live Venue for two years running at the Live UK Business Awards in 2011 and 2012.